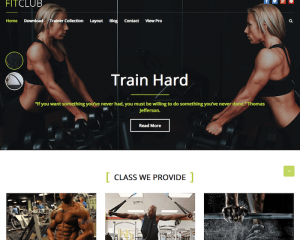 The fitness category gives a selection of WordPress themes that can be used to create a fitness-related websites. These websites can be used by either individuals or businesses who want to provide enough information about health and fitness to their audience. If you are selling some fitness products, you can use one of these themes to promote your products to your potential customers. If you are a fitness instructor who wants to share some information about health and fitness to your potential students, then you can also use one of these themes to build a website to share that information. Since the theme is designed for fitness niche, you can ensure that you get the proper materials for your website.